R. B. Dyechem Pvt. Ltd is a well-renowned name amongst the topmost manufacturer and exporter of Holi Colour products. Our company believes in attaining 100% customer satisfaction and is known for the same in the world market. We are backed by a dexterous team of skilled professionals who strives to ensure the steadily delivery of best quality product to our customers worldwide. Being a quality based company; we have hired industry experts to check every manufactured product under strict parameter. Our products are certified from NTC for no irritation and no oral toxicity. They also adhere to European norms and American norms. Our responsibility doesn’t end with creating the best quality product we also ensure that our products are delivered to our clients safely. Our colors are blissfully accepted all around the world. 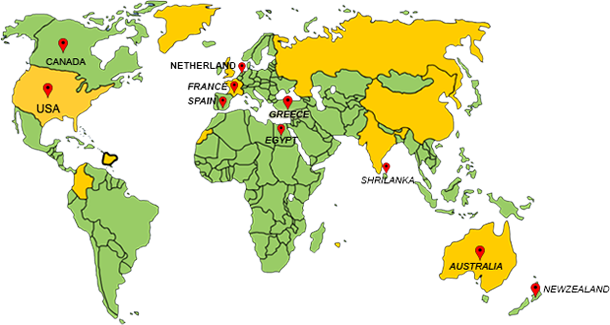 Currently, we are serving to many countries including USA, Australia, UK, Portugal, France, Germany, Egypt, Netherlands, South Africa, Greece and many more.